The smallest keyboard ever produced. The typewriter that would fit in your pocket. that was the unique selling point of this typewriter. 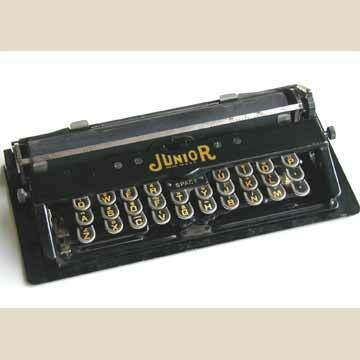 The Junior, invented by Charles Bennett, appeared in 1907. A slightly improved version, with a ribbon and paper table, appeared in 1910, called the Bennett. The keys on the miniature keyboard were fitted extremely close together. Pressing the top key in a row would bring down the ones underneath at the same time (pic 5). Note the odd central place for the space key.